The Metro Transit Technician Training Program was celebrated as an industry-leading workforce development program this week. The recognition came in the form of a Model Program award from the National Transit Institute, a Rutgers University-based organization that develops, promotes and delivers training and education programs for the transit industry. 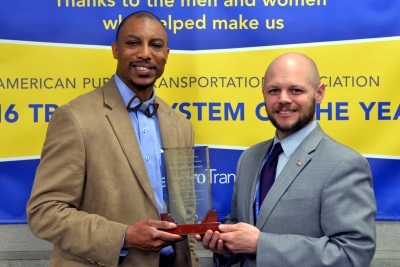 The award was presented at the institute’s Transit Trainers’ Workshop, held in Nashville, Tenn. The Metro Transit Technician Training Program (MTT) puts job seekers on a path to full-time roles as bus or rail technicians through a combination of job and skills training, a paid internship and support toward earning an associate degree. Participants are not required to have any prior experience. An initial group of MTT participants pursuing careers in bus maintenance are currently enrolled at Hennepin Technical College while working as interns in several service garages. A second group of participants pursuing careers in rail vehicle and systems maintenance will begin on-the-job training next week. The training program was developed in partnership with the Amalgamated Transit Union-Local 1005, Twin Cities R!SE and Hennepin Technical College. Mechanic-Technicians have also served as mentors. Funding has come from the state and the Federal Transit Administration.